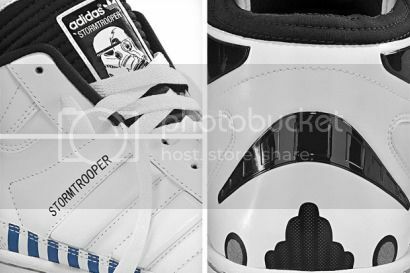 Yeah, so a pair of Stormtrooper Star Wars adidas Originals sneakers makes all kinds of sense, as you can see in the photos, below. For its Spring/Summer season adidas Originals teamed up with Star Wars for a memorable collection of footwear and apparel. […] this new collection seamlessly fuses inspiration from legendary Star Wars characters and scenes with iconic adidas Originals silhouettes. The pieces begin to hit all adidas Originals stores and other select retailers in January 2010 while a closer look into the lineup will soon be made available. 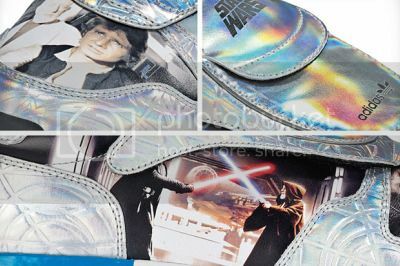 But everything that can go wrong with other Star Wars/adidas mashups… will go wrong. Seriously. That thing is a nightmare to look at, required the opposite of “ingenuity” to develop, and was clearly created with very little regard or respect for Star Wars fans. In other words, I assume George Lucas personally designed it. * Yeah, what do you know. That part of the sneaker is called the “foxing.” I was surprised, too. Couldn’t they have at least rearranged the picture so that Darth Vader wouldn’t be headless? I mean, the shoes would still be terrible for all the reasons you listed, but that makes it seem like they’re actually *trying* to make them as crappy-looking as possible. I do like the Stormtrooper ones, though.